Once again this year all of our Yearbook prices are unchanged. We offer three types of binding - as detailed below - so there's a book for every budget. Up to 56 pages: €16 per copy. Saddle stitched books have a stapled binding and are only suitable for Yearbooks with 56 pages or less. Up to 64 pages: €18 per copy. From 65 - 84 pages: €20 per copy. From 85 - 100 pages: €22 per copy. More than 100 pages: Please contact us. Need fewer pages? If your soft cover Yearbook has 48 pages or less we will be able to give you an even better price per copy, whatever type of binding you select. Hardback Books are also available, with prices starting from €20 for a book with up to 60 pages. Please contact us for more information. Note: the prices quoted above are based on a minimum order of 60 Yearbooks. If you require a smaller quantity, please contact us for a quote. If you are ordering 120+ books we’ll be able to give you an even better quote. Deadlines: If you are looking for a book for a Secondary school, we will need to have heard from you by March 23rd 2018 if you want to have your book by mid-May. For Primary schools, looking for books by mid-June, we will need to have heard from you by April 20th, 2018. If you would like more information on our Yearbooks, or would like a free sample Yearbook, please contact us via email. Please include the name of your school or organisation. If you request a sample Yearbook remember to include a postal address. Historically, our main focus has been on Yearbooks for Leaving Cert years, but we also design books for Transition Year classes, Primary Schools and Crèches. Whatever type of book you would like to print for your class, school or organisation, please contact us and we will provide you with all of the information you need. Moonswing is a company based in Athlone, Co. Westmeath that produces School Yearbooks for Irish schools - both Secondary and Primary. We don't just print School Yearbooks; we also take care of all of the design and page layout work. The cost of each finished Yearbook is all you'll pay - there are no charges for the production process or for the delivery of the Yearbooks. Moonswing has been designing and printing School Yearbooks since 2006. To date, our customers have included Secondary schools in Dublin, Cork, Galway, Meath, Wicklow, Cavan, Monaghan, Clare, Wexford, Tipperary and Mayo, as well as Primary schools all around the country. You can see some of the covers of our past Yearbooks on this page. Moonswing’s Yearbooks combine colour pictures and text on every page to create beautiful, long lasting, and very affordable mementos for final year students. Our Yearbooks will be a treasured possession for the alumni of a school for years to come. We do not use preset layouts or page templates in our design process. 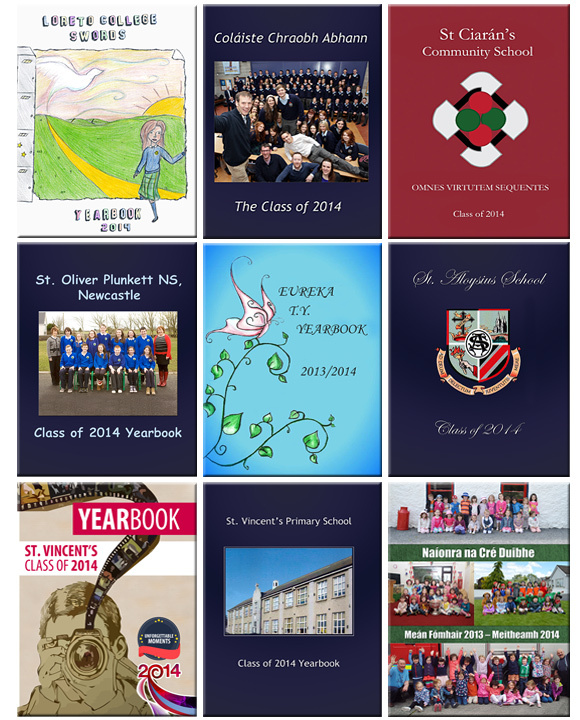 We create a Yearbook to your specifications, rather than obliging you to follow ours. Contact us for further information and to be sent a free sample Yearbook. Our Yearbook designs are 100% flexible. We are happy to discuss all stages of the design process with you, to ensure you achieve the best possible results. However, if you want to just send us articles and photos, and let us take care of the design, that's fine too. Our Yearbooks are available as hardback or soft cover books. •	Full colour, glossy front and back covers. •	Individual pictures of each student (e.g. 6 per page on a 11x8 page) with a piece of text (perhaps answers to a questionnaire) accompanying each picture. •	Pages of pictures and text highlighting sports, clubs, achievements, etc. •	Collages of casual photos, photos of the students from first year, etc. •	A number of blank pages at the back of the book for students' autographs. Any printed material that is sent to us (e.g. photos that need to be scanned) will be returned intact when the process is completed. If you are interested in creating a Yearbook for your school we will be happy to talk you through the process. The entire process, from initial discussion to final delivery of the Yearbooks, typically takes three months. Hardback books will take several weeks longer to print than soft cover books. Obviously we suggest starting the process as soon as possible so as to free up the Yearbook Committee well before exam time. For a more detailed overview on the Yearbook creation process please download/ view our Yearbook Information document.